Question: How long will my bra last? Answer: That depends on how you care for it. Sorry to be vague, but every bra – and bra owner is different. A well cared for bra could last a couple of years. Don’t hold me to that because there are A LOT of variables that play into the life of a bra (bra quality, breast size, bra rotation, how you put it on, how you care for your bra, and on and on). Our vendors say that your intimate lingerie shouldn’t have a birthday. Remember, you wear a bra every day. If you are wearing the same 1, 2 or 3 bras in a week, that’s a lot of wear. Lingerie in general should be hand washed in cool water with an appropriate cleanser. It’s especially important for shaped, padded, underwire or lace bras and other delicate fabric items. The purpose is to protect the investment you’ve made and extend the life of each piece. 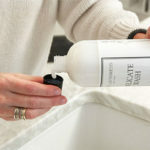 We recommend The Laundress products because they are naturally derived solutions that clean exceptionally well without scrubbing and maintain fabric quality. This is so important for the delicate fabrics and lace of intimates. I’ve personally used The Laundress products for 15 years and see the difference in my lingerie compared to others who use a grocery store brand. Good to know: Some detergent brands actually break down the elastic in your bra. BTW, we carry The Laundress Products (saves you shipping costs). The normal cycle of a washer puts too much strain on the fabric and can damage the shape. And the dryer is the kiss of death to the elastic in your bra. When I hear that the wire has come out of a bra, that is the result of throwing a bra in the dryer. Don’t do that unless you want your bras to be disposable. In the washing process, it’s only about 5 minutes of hands on actively cleaning and a couple of minutes of actively rinsing. But allow for an additional 30 minutes for soaking. Utilizing The Laundress Wash & Stain Bar, wet the bar and rub directly on stains and key areas such as underwires, bands and straps. The Wash and Stain Bar works the material to remove dirt, grease, oil, sunscreen, and makeup. For more difficult stains such as coffee, tea or wine stains The Laundress Stain Solution is a great product. Allowing the items to soak for 30 minutes in cool water serves two purposes. It full allows the body oils to dissolve and be removed from the fabric. The cool water also helps the elastic shrink back to its original shape. Fully rinse out the items in fresh water to remove all residue. Press out excess water and hang or lay flat to dry. As hinted at above, another way to extending the life of your bra is to not wear the same bra every day. You need to have a few bras to rotate to let your bra rest for a day or two before wearing it again. Wearing the same bra every day is hard on the elastic in the band and doesn’t give it a chance to go back in place. It’s like stretching a rubber band and keeping it stretched. Eventually it stays that way. Wearing the same bra every day means you’ll be ready for a new one in 3-6 months.